I landed in the hot and humid Caribbean paradise Cartegena following an 80-minute flight from Bogota with Copa Airlines that cost me $120 USD one-way. From the airport I easily caught a cab with my travel companion for COP $10,000 ($5) that took us to our hotel San Roque Cartagena with a 10-minute easy ride. We stayed outside the walls that surrounded the old colonial town and the walk to the heart of everything was just 10 minutes. 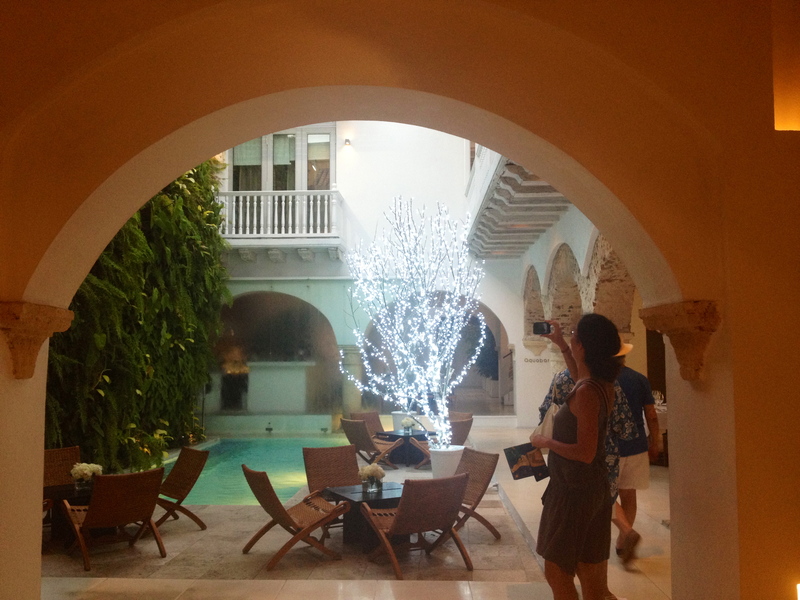 I found Cartagena so magical from the moment I stepped my foot in. As soon as you cross to the other side of the walls, you feel like you are in a movie scene..as if Antonio Banderas will turn around the corner on his horse and pull you off your feet. The stone houses painted in vibrant colors with flowers spilling down their balconies and their huge doors opening to mysterious courtyards made us forget about the nasty humid weather and the mosquitos who were waiting to eat us alive as soon as we took a break from walking. It’s easy to get lost in the narrow streets of Cartagena and it can take hours to find your hotel but for me that was the most fun part 🙂 In each street you make a turn to, you find yourself in front of some unexpected beautiful house, restaurant, spa, boutique or library. The ocean in Cartagena was way too wavy and the beaches too touristy hence we took a boat tour to Playa Blanca (La Isla Rosario boat) in the morning. Even though we were told that we had just missed the 9 am (last) boat, we were able to get on a 10 am boat magically offered by a guy we bumped into on the street. The islands were very beautiful with white sand beaches and small houses on some of them as the pictures below will speak for themselves. Note to self: Next time, go directly to Baru to stay at least a couple of days. 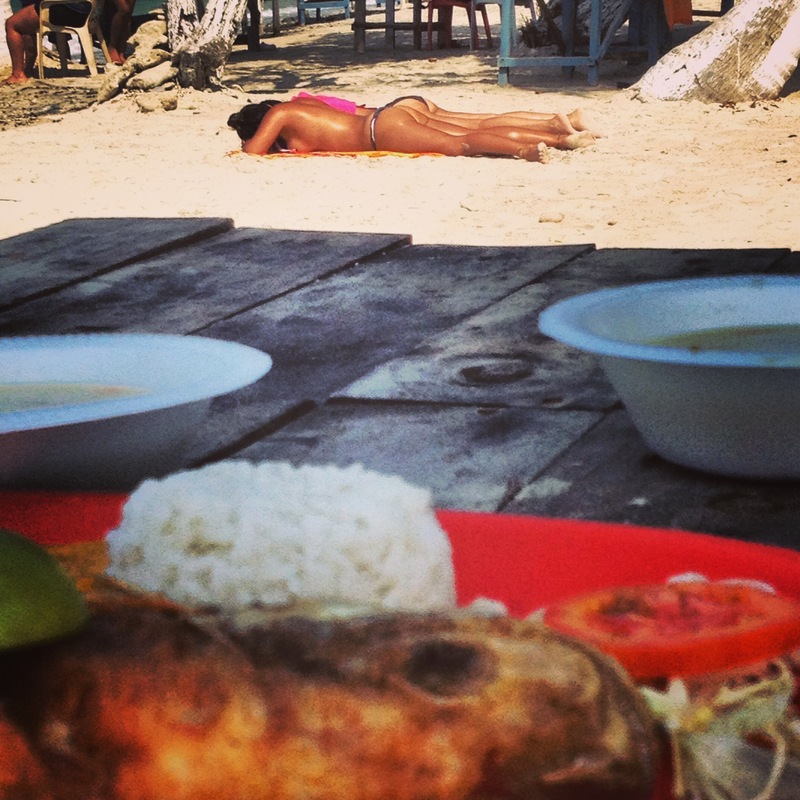 Tip: If you take this boat trip, you can stay on the beach in Baru (first stop) instead of continuing to the aquarium as there’s nothing to see there unless you have a young kid with you. You can get on the same boat from Baru on its way back to Cartagena. On another day, we decided to discover Playa Linda, which didn’t seem linda at all, with a small boat we got on. We spent the whole day cleaning the beach from plastic bags and bottles and ended the day with a bad sun burnt! But it was worth doing something good, even though probably the same amount garbage would wash ashore through Cartagena the next day again. After 4 days in Cartagena, we decided to continue to Santa Marta with a door-to-door shuttle. It was a 4.5 hr ride that cost $40, which was worth it. The other option was to deal with several cabs and buses and spend the whole day on the road. Santa Marta is like a big slum with heavy traffic, noise, pollution, and city chaos. We stayed 2 nights in Casa Aluna whose owners were two Irish brothers who were extremely helpful in answering all of my various questions including Spanish vocabulary. Since I didn’t find anything interesting to do in Santa Marta, I packed and moved to Taganga with a 15 mins minibus ride the next morning upon the departure of my travel companion. Apparently, Taganga was a small fishing town near the large port of Santa Marta before travelers discovered it a few years ago. The once quiet village of a few thousand Colombians now is turned into a hub for the tourist party crowd. You see a lot of hippy Colombian street artists selling handmade crafts and accessories, and young musicians sleeping on the warm streets of the town. You smell marijuana all the time on the beach and the police are searching young ppl’s bags and clothes constantly. I am not sure how this all worked out as the smoking and searching continued all week long. Of course street shopping never ended, especially for more Mochilas (traditional, handcrafted, colorful bags). After changing a couple of hostels that were in the busy/loud beach front area, I moved to La Casa de Felipe all the way in the back of the town and spent a few relaxing days on the hammocks placed in the garden or on the balconies before heading to my next destination: Ciudad Perdida (The Lost City)! Tip: Don’t miss the beautiful sunset view on the 2nd floor of Babaganush overlooking the ocean. While in Taganga, I decided to join the 5 day trek to la Ciudad Perdida, Lost City, for which I wrote a separate blog entry here. It was absolutely amazing to have done something like that and I recommend it to anyone who is in OK shape and ready to move up and down in the lush green landscape of the Sierra Nevada Mountains and learn the history of the region. My last stop in the Parque Tayrona region was Palomino where I reached by the minibus minibus I caught on the main street in Santa Marta. Palomino covers a very small area on the coast but it has a beautiful vibe. I stayed at Dreamers hostel that had a nice pool as bonus, which became useful since the giant waves were not very welcoming during my visit. You can reach Palomino with a minibus that you can take from mercado (carrera 11& calle 11) COP $8000 and it’s 1.5 hrs from Santa Marta. If you happen to go there, you should absolutely try tubing that was so much fun! You can rent tubes from the only shop with the tubes hanging outside in the tiny town of Palomino and get transported to the top of the mountain by some young motorbikers. When they drop you off and point at a path among the bushes, the walking an hour through the jungle starts. Then you get to the relaxing, floating part of the adventure.You jump in the river with an inflated inner tube and float downstream. Along the way, I was amazed by the beautiful scenery of steep, green mountains, birds, butterflies, and the sky that totally made me realize, remember, and be grateful for what the universe has got to offer us. While my new friends and I were curious about how long we had been in the water, or whether we should have exited somewhere, we understood we came to the end when we the river met the sea and the tubes eventually stopped going. I can’t think of a better way to spend a relaxing yet active day in the water! Salento was recommended to me by some good hearted backpackers when I couldn’t stop talking about my need to drink real, freshly made Colombian coffee. So they told me to go to the coffee region Cafeteria and that’s how the journey to beautiful Salento from Santa Marta started. Since I was in a hurry to get there for my next morning coffee, taking a plane was inevitable. I stayed at Hostal La Serrana for COP $20,000/night, which is a family run communal style hostel where everybody is cooking and eating together. We did a movie night and I was happy to see they had Darjeeling Limited in their archive. I have met a few ppl who went there for a few days but who had been there a few months already. The place was in the middle of a green valley a bit outside of the center (20-30 min walk) but situated conveniently on the way to the coffee farms! There were beautiful flowers, plants, and horses everywhere I looked. It was a true heaven. The view from La Serrana. Finca tour: I took the less commercial, smaller, family run Coffee tour with Don Elias and it cost COP $5,000 for 1-1.5 hr. They offered us freshly made coffee from their land as an adios gift. It was a nice/weird coincidence to come across a friend I had met back in Parque Tayrona in this finca. Even weirder than that, I bumped into him again in Ecuador a few weeks later! Then we got married. Nope, kidding. Don Elias, the head of the coffee farm.. He looks perfect for his job, right? Next day, I went to Valle de Corcora by taking a jeep taxi in the town center for COP $3,000 at 8:30 am (every hour on w/e). I recommend you to go earlier in the morning since the fog that sets in in the afternoon (3-4ish) blocks the view. And the scenic view is a pity to miss. Went to Colombia just a few months ago and did the Lost City trek as well. Loved it! What an adventure! What a great funny and visual blog. Lovely blog and articles. Helped me as I am in Colombia at the moment. I wanted to know how did you manage to “book the atahuasca retreat”? A y help would be very welcome. Thanks! I’m glad you were able to use some tips from my blog! 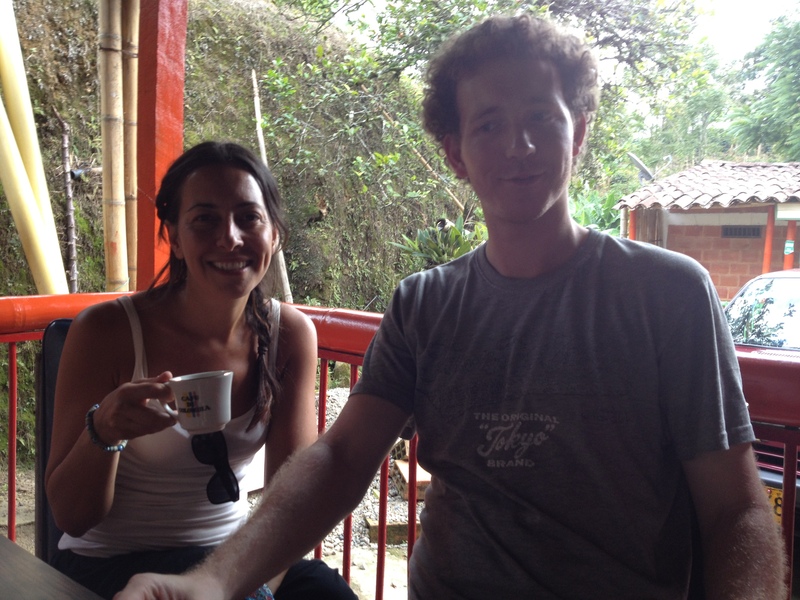 I have another blog entry just about ayahuasca. Please take a look at it. The ones I have attended were all private/referral based ceremonies. If you are planning to go to Salento, which I highly recommend, there was a shaman nearby. I bumped into a group which were visiting him departing from Hostal Serrano on a regular basis. I didn’t do with him but heard positive things. This was 3 years ago so please make sure you ask around and get more info and follow your heart. But when you are ready the medicine will find you anywhere 🙂 good luck Brice! I’ve been unable to find your specific entry on ayahuasca but I’m very interested to read it – any chance you could link to it, please? Thank you! Beautiful write up. Thank you so much for sharing with us your travels. Inspired me to visit pronto. Is there one place in your travels that you could call home “like i could see myself being there for the rest of my life”?